Home/Toddler Music/When do babies start to understand music? From the time you found out you were expecting you probably started playing music for your baby, likely without even knowing whether it was beneficial to them. Sure, you’ve heard that popping headphones on your belly is something you should do, but is music really that big of a deal to babies? The truth is, studies have shown that exposing babies to music as early as possible is great for their development. Whether you play music around the house, teach song sing along songs or join group baby music classes you are helping your little one to develop their awareness and learn about their world with hardly any effort. Playing music together not only helps your child’s development, it can also work magic on your relationship with them. At Capstone Music, we love introducing babies to music! That’s why we developed the “Baby and Me” music program, just for your little ones! Babies can hear well very quickly after birth, so playing music for them from early on actually benefits their physical, intellectual and emotional development more than you realize. Music also plays a role in developing their sensory world. Holding toys that make noise shows babies that their movements have an effect on the world around them, and that objects can make sounds with their help. These skills help to build pathways in the brain that are related to speech, spatial awareness and relationships with those around them. Music helps strengthen early language pathways. Playing music for young babies stimulates them to start understanding and repeating your words sooner than if you don’t play music for them. Children’s songs like ‘Row, Row, Row Your Boat’ and ‘Five Little Monkeys’ help your baby to pick up letter sounds and figure out how to differentiate between similar sounding words. These are the beginning building blocks to good speech development. Spending one on one time with your baby is naturally going to improve your relationship, but adding in music is a great way to improve it even more. Similar to how dancing releases oxytocin- a hormone tied to happiness and bonding- so does taking time to sing, dance and play music with your baby. Helping them to dance to the beat or do hand motions along with certain songs is the perfect opportunity for physical touch, which is another way that a parent/child relationship is strengthened and body awareness is taught. We’ve all sang songs like ‘The Wheels on the Bus’ and ‘Old MacDonald had a Farm’. Songs like this are perfect examples of ways that music can help build memory. But the effects go even deeper than remembering the words to a repetitive song. Babies may not be able to repeat the words or sing along, but the repeating beat builds pathways in their brain that works with patterns and the resulting expectations. Learning that clapping, stomping and shaking an instrument can result in sounds helps babies to learn that they can effect the world around them. Knowing how their body works is a big step towards figuring out their place in the world. Incorporating music in your baby’s or toddler’s day to day life will have a lasting effect on many parts of their lives. Even if you don’t see the results right away, young children pick up so many pieces of language and understand rhythm from the get go. 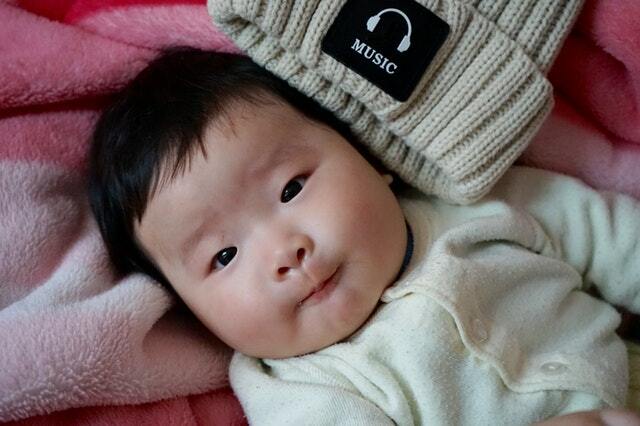 Introduce your baby to a lifelong love of music right away! 2019-03-19T18:47:19+00:00By Capstone Music Editor|Toddler Music|Comments Off on When do babies start to understand music? At Capstone Music, we do more than provide top quality music lessons from Burlington's best music teachers :) We love writing original articles on music and it's power to teach and uplift our students and all our readers. Read original content from our very own editorial team at Capstone Music!